After a relaxing day off we awoke on day 43 and starting getting our gear together. I had another excellent breakfast at the diner in Lima and bought a few last minute supplies from the convenience store. We were in the back of the shuttle by 12 back to the trail. As we were all pulling our packs out of the truck, Doug’s bear spray slipped out and exploded in a red cloud all around the truck. Fortunately we all noticed right away and ran back from the truck, nobody getting a full dose to the face. After cleaning up and a little coughing we hit the trail for a fairly easy 17 miles. Arriving in camp cold and wet after a little rain, glad for hot food and a warm quilt. The morning of Day 44 wasn’t as cold as I’d expect so after a leisurely breakfast I set out on the trail about 7:15. For the first few hours I didn’t see another soul and enjoyed the solitude. We ran the ridge before dropping down into a beautiful valley, aided by some nice switchbacks. Throughout the day I must have crossed paths with at least 15 northbound thruhikers. A lot of them were really friendly and one talked excitedly of the beauty to come in Wyoming and the Winds. The afternoon was spent up on the divide with vistas all around, we grabbed a bunch of water as we would be dry camping in the middle of an 18 mile dry stretch. We found a flat spot by the side of the trail to setup our tents and after dinner and some whiskey settled in for some zzz’s. First thing on day 45 we went straight up a 1000 foot climb but thankfully there were good switchbacks. The views from the top were epic even though there was a lot of smoke in the air. After riding the ridge we slowly made our descent. 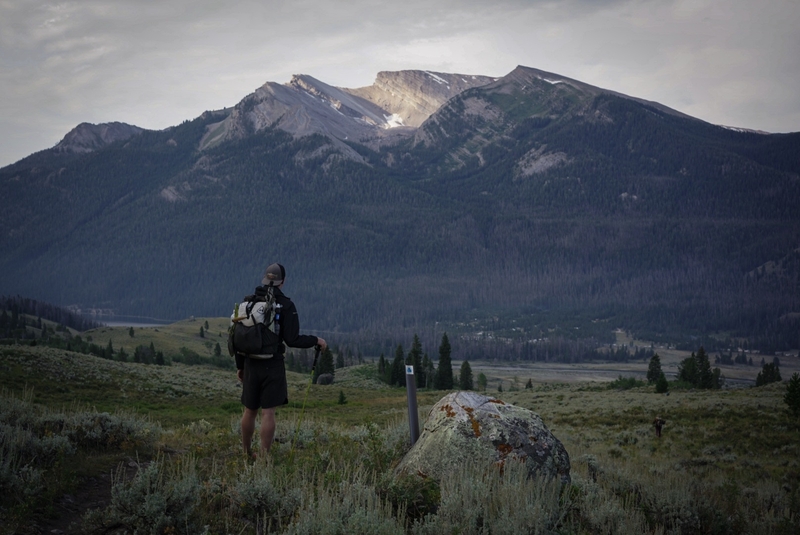 We made the decision to take the Macks Inn cutoff, a shorter and more direct route to Yellowstone. The first 8 miles of the cutoff though was quite the bushwhacked, one minute we were on a small trail the next minute it was gone. Eventually we joined up with dirt roads which would be following for the next few days into Yellowstone. The cutoff also passes right by a grocery store, I fell to sleep dreaming of all the food I’d pick up the following morning. And they’re off! Waking up knowing your about to hit a fully stocked grocery store means no ones’ hanging around in the morning. Day 46 started with a super gradual downhill road walk of 8 miles. The first thing I spotted when I got into town was a place selling espresso coffee, a large Americano with an extra shot please. The next couple of hours was spent across the street eating grocery store food and making phone calls whilst sipping on a beer. Eventually we got back out on the trail, well actually it was another long road walk before we would be back on actual trail. Our total for the day was around 20 miles, less than we had originally planned but these things happen. Day 46 would be the day we would leave Montana and Idaho for good and enter into Wyoming. Oh and also enter Yellowstone National Park, one of THE most iconic landmarks along the CDT. Despite a sprinkling of rain first thing in the morning we started off hiking under big puffy clouds with the sun breaking through in epic fashion. As we made our way deeper into Yellowstone the environment changed quickly and we dropped into a valley of geothermal activity. And lots of people. We spent some time amongst the geysers before ending up inevitably sitting outside a grocery store eating more food than was good for us. We tackled the permit problem and settled into a motel on the the outskirts of the park. I also found out that my girlfriend would be flying out to hang out with us for a week or so at the end of August, it was something we had been talking about but I was so excited to hear it was definitely happening. We started day 47 at the Yellowstone post office opening packages followed by more consumption of calories. We got a later start than planned but fortunately only had 14 miles to do. I left Yellowstone village feeling frustrated at not being able to spend more time exploring the close by geysers and the charismatic Yellowstone lodge. About five miles into the hike we started seeing small bubbling geothermal pools. The next thing we knew we were in a valley full of geothermal pools of various sizes and shapes, erupting all around. I can probably say that was my single favorite part of the CDT thus far. After taking it all in and snapping some photos we pushed on the final wet and swampy miles to camp. Just before we arrived I spotted a porcupine close to the trail. We looked at each other for a second before he slowly walked away from me, seemingly unimpressed by my presence. Despite being a rainy day and having wet feet I went to bed having had one of my favorite days on trail. 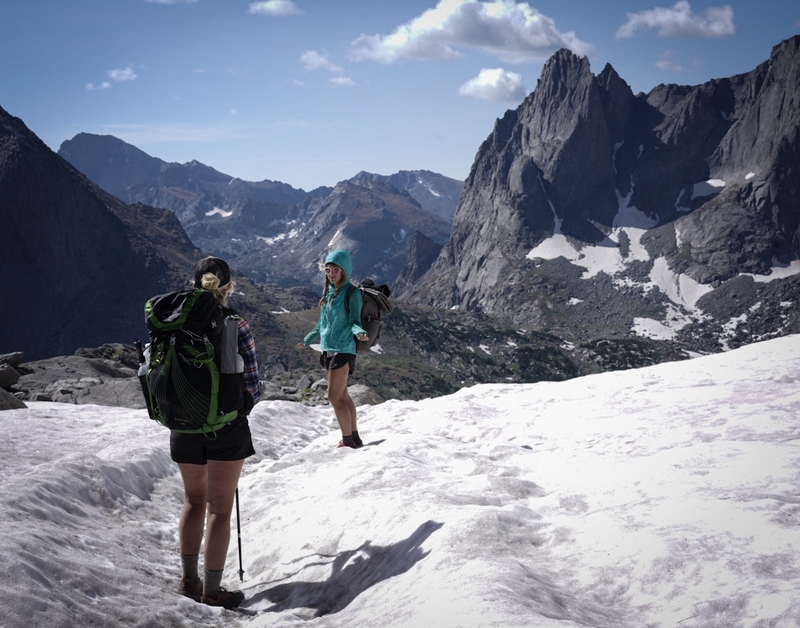 The permit situation in Yellowstone was no where near as difficult as Glacier. Our first day was 14 miles which was a nice rest and our second, day 48 would be a 24. The day started cold with a good amount of condensation on our tents and sleeping bags. The normal day ensued with my mind wandering pleasantly and my eyes taking in the beauty of Yellowstone. We had been told by some people that the CDT through Yellowstone was “meh”, I believe it is decidedly not “meh”. Vast open vistas with big puffy clouds, Geysers spewing sulfuric smelling steam and an array of wildlife. After drying out our gear at lunch we were inevitably treated to several cold stream crossings and an afternoon thunderstorm. We arrived in camp wet but not defeated. Some conversations with dinner and then we went to bed at 09:30, the temperature had already dropped to almost 40 degrees. It was going to be a cold night. Morning of day 49 we had terrible condensation. The designated camp site for us was in the middle of a meadow, in a valley, next to a river. Not the best spot for a campsite. It was also one of the coldest nights/mornings on trail with a layer of frost covering our tents and the surrounding tall grass. 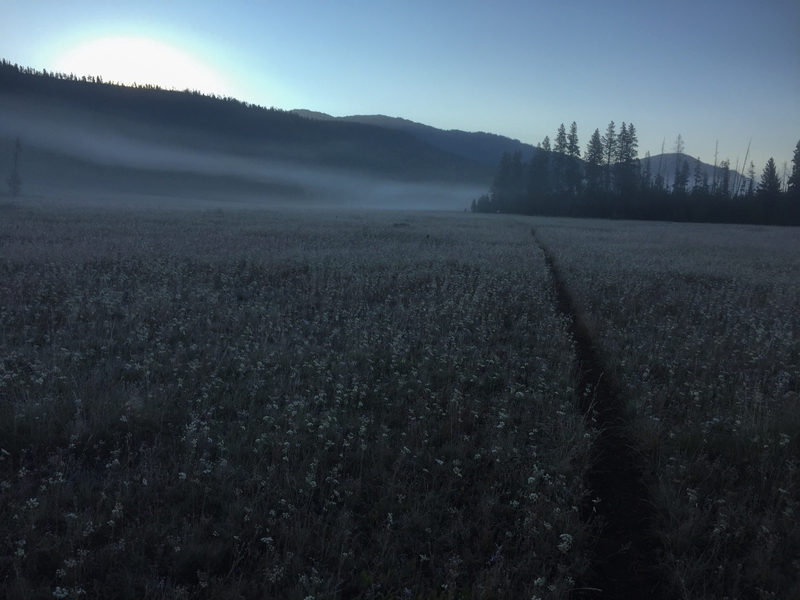 The trail itself was beautiful, fog sitting in the valleys and the tall grass shimmering white gold. Once I’d warmed up I got into a good rhythm and the miles came along. In the afternoon we got up on a ridge and saw the Winds in one direction and the Tetons in another, both looked snow covered and epic. After a few more miles and some epic mac and cheese it was time for Zzz land. Day 50. 50 days since the adventure started. I didn’t sleep well at all, I awoke at 2am cold, I put on all of my layers but it took me a while to warm up and get back to sleep. I need to figure out what to do when the temperatures get even colder. I think my lack of sleep led to a day of feeling tired and unmotivated. We had a couple of good size climbs and I wasn’t feeling it but pushed on regardless. Having a great little group really helped me out. We managed to get in about 26 miles and set up camp in the dark. With only 8.5 miles to cover in the morning to get to the road in which we would hitch to Dubois, Wyoming. Day 51 was town day. Alarm set at five and up and on trail by about 6am. It was a beautiful and fairly easy morning of hiking to get us to the highway that would take us to Dubois. The town itself was a perfect little Hiker town. A good grocery store, a laundrette with showers and a lovely church community space with a kitchen for hikers to use for a donation! There were plenty of chores that needed to be done in town but we managed to enjoy some good food cooked in the kitchen and a few beers in the saloon. Day 52 I awoke after a pretty bad nights sleep, too much town food had upset my stomach throughout the night. 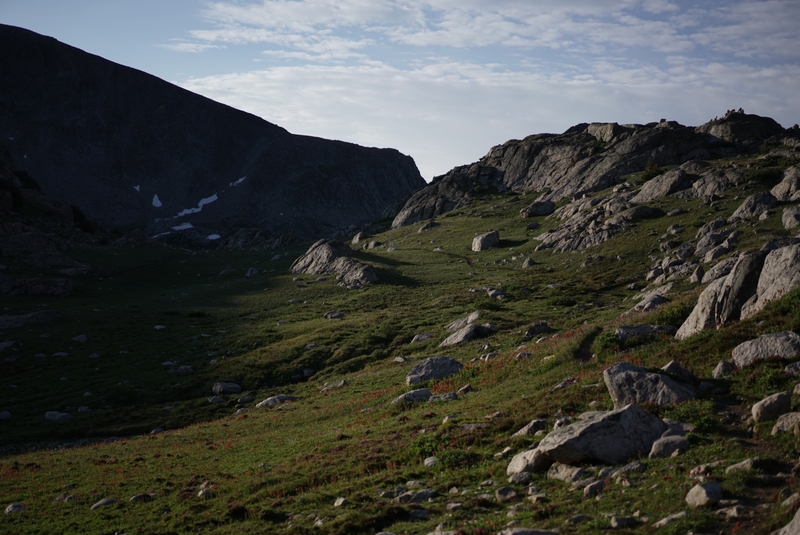 Nevertheless we all packed up our supplies for the next section, the Wind River Range. Supposedly the most beautiful area of the entire CDT. No one was particularly motivated to leave town and we also still had plenty of things to take care of. I eventually got back on trail about 1pm and the others caught up a short time later. We hiked into the night and managed to do just shy of 17 miles. The next day would be a 30 mile day so we set up and settled in. The start of day 53 probably couldn’t have been more amazing. I left camp alone and about 10 minutes later, standing about 50 yards in front of me stood a wolf. He stared at me and I at him. We was taller and longer than a husky, almost jet black apart from a dark grey underbelly and snout. I pulled out the bear spray but never felt threatened. He slinked off into the woods and I continued on the trail with a huge smile on my face. Five minutes later I looked off to the left and he was in the tree line looking at me and heading in the same direction as me. He seemed neither aggressive nor scared. Eventually I lost sight of him. It was probably my single most amazing experience in the wilderness. The rest of the day was through rolling hills and muddy swamps. We managed to bushwhack and cut off almost five miles from the day, making it 28 miles hiked but 33 miles further down the trail. Sweet. Day 54 was the day of the solar eclipse. We hiked five miles down into the valley to meet the film crew and sit down to watch. I was completely blown away by it, way cooler than I expected it to be. The darkening of the sky seemed to boost the saturation of the sky and lake around us but was almost impossible to capture. After all the commotion we kept on moving south, past hoards of day hikers and overnighters’ coming out of the woods. We started into the Wind Rivers’ proper with huge cliffs and peaks all around us with glacial melt rivers running through the valley. We settled into camp early, a 3000 foot climb waiting for us in the morning. Half the group (myself included) chose to hike the official CDT the following day and the other group chose the Knapsack Col alternate. Both the routes were said to be beautiful but Knapsack Col a little more epic but apparently a bit sketchy. I chose to play it safe. The climb at the start of day 55 was no joke but fortunately I was full of bagels and coffee and the climb went by quickly. Once we got up to 10,000 feet the scenery changed dramatically, we were in The Winds proper. Grassy meadows with wilds flowers and running streams surrounded by sheer mountains dotted with snow. The entire day was a wow moment, with A new epic view around every bend. There were lots of section hikers out, all very friendly and asking lots of questions. It makes me really happy seeing so many people out enjoying this wonderful earth. I felt energized throughout the day and spent much of it hiking alone with my thoughts and my camera. We had made loose plans to meet up with the guys who took the alternate, but they never caught up with us. We assumed it took them longer than expected and that they would catch up with us the following day. Day 56 started off right. We’d found an awesome camp spot the night before, with the views being priority number one. I awoke just as the sun was creeping into the valley with some large peaks visible right from my open tent. I enjoyed breakfast and hot coffee, admiring the view from the warmth of my sleeping bag. The terrain for the day was pretty flat with some rolling hills and wide open plains. The previous day was blue sky and sun but today was overcast and grey from start to finish. I expected rain several times throughout the day but luckily it never came. 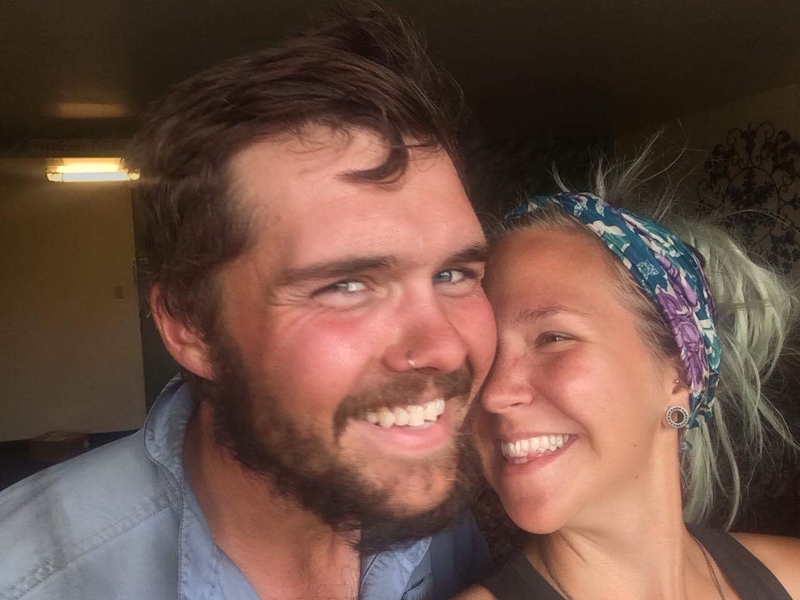 I also found out that my girlfriend would be meeting us on trail the next day. She had flown out to spend a few days together and I couldn’t be more excited to see her after two months apart. We did 25 for the day and camped at the junction for the Cirque de Towers alternate, one of the supposed highlights of the Winds. I was excited for day 57 when I woke up for two reasons. One being that we were about to hike the Cirque de Towers and the second that I would get to see Michelle at lunch. The first eleven miles of the day were harder than expected but oh so rewarding. At one point we thought we’d taken a wrong turn to a dead end. We then realized that we were going straight up a steep rock scramble (Texas pass), the view at the top of the pass made it all worth it. After a few more epic scenery filled ups and downs I made it down to Big Sandy Lake and Michelle. It was like beauty and the beast. Me all stinky and sunburnt and her all smiles and smelling of shampoo. We ate lunch together and chatted, two months apart had been a test. I’d be seeing her again the next day in town so eventually I had to get back on trail and get miles done. We ended up doing another pass that day, one I was totally unaware of. It was a brutally steep rock scramble followed by the most sketchy snow traverse I’ve ever done. Steep and no way of saving yourself even if you did have an ice axe. I found out later that a lot of the guys had climbed up and around the snow field because they thought it was too sketchy. I should have done the same in hindsight. Anyway i survived and finished out a 24 ish mile day. Next day – Lander. Having covered a good distance the previous day we only had to do 24 Miles into Lander on day 58. It also happened to be a fairly flat and easy stretch. Motivated by seeing Michelle and eating town food I pushed hard and got to the road around 3pm. An easy hitch from an awesome local saw me sat outside Macdonalds with Michelle, inhaling calories and feeling overwhelmed by the cars and bustle of a busy town. Day 59 was our Zero day in Lander. Lander was one of my favorite trail towns thus far. An awesome brewery, multiple grocery stores and a piping hot hot tub at the motel. Aside from the usual town activities our main focus was the Mayweather vs MacGregor fight. Being a big MMA fan I had been excited about the fight for a while. Of course we had terrible wifi and had severe technical difficulties trying to stream the fight but we managed to figure it out and I was thoroughly impressed by Connors’ performance but not surprised by the result. Day 60 I had a hard decision to make. Michelle was only going to be around for the next couple of days and once I got back on trail I’d only see her briefly before she left. Once I’d heard she would be visiting I’d played this scenario over in my mind. I made the decision to skip the Great Basin. I made the decision to spend a few days with My girlfriend of seven years. To yellow blaze forward and continue hiking from Rawlings with the rest of the hikers. 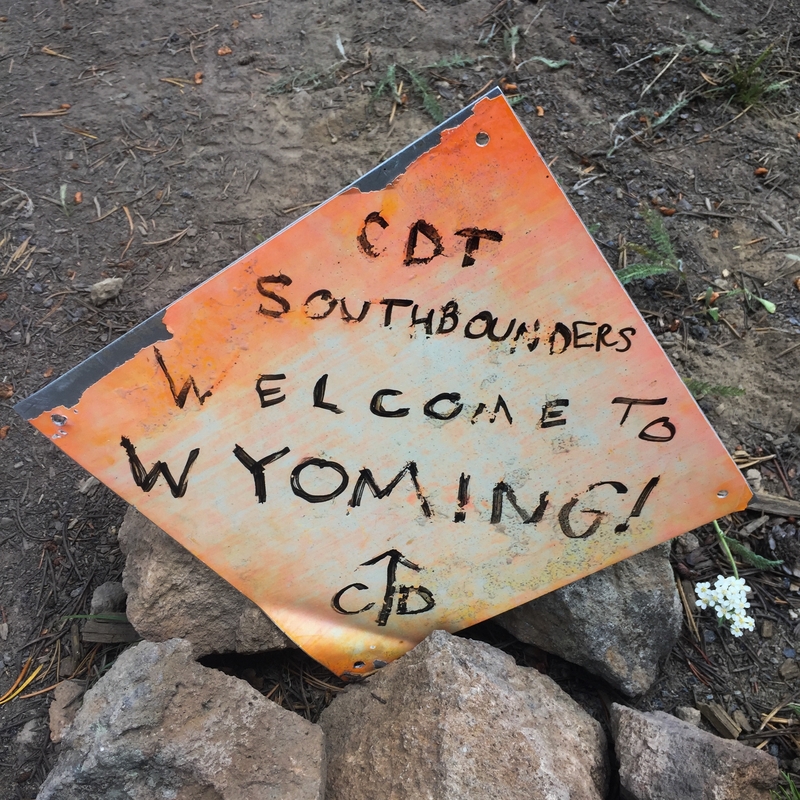 I never skipped forward on the AT and the decision to skip a section on the CDT didn’t come lightly. She’d flown a long way to see me and I felt I made the right decision for us and our relationship. Once I’d made the decision I took care of more town chores. The other hikers headed back up to the trail, the sun scorching in the sky. They planned to do about 15 for the day and then attempt to do 50+ mile days to reach Rawlings. An ambitious goal. The morning of Day 61 we packed up and got all our gear loaded into the film crews vehicles. The plan was to meet the hikers halfway through the Great Basin. We parked up on a dirt road that crossed the CDT as day became night. At 10pm Trevor rolled in after 49.5 miles, dizzy and spaced out but in good spirits. The crew interviewed him and he pushed off into the night, a spring 3 miles away his destination. We all went to bed but were awoken at 2:30 am by the sound of Beans and Phantom passing by. They also had done a huge day and were not planning on stopping. They answered some of the crews questions, swallowed some caffeine pills and off they went. We went back to sleep. 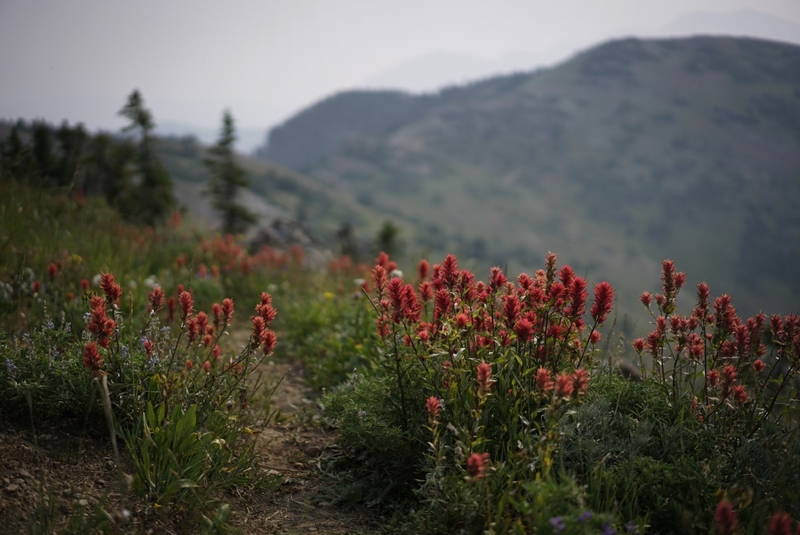 Pie – great to follow your blogs on your epic hike! Looking forward to following you all the way!